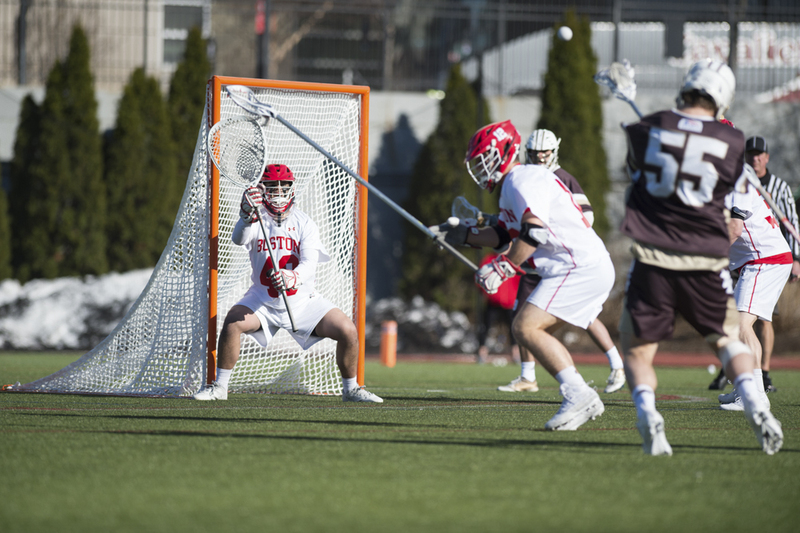 For the first time in four seasons, the Boston University men’s lacrosse team found itself without an obvious answer as to who would be the starting goalkeeper for the 2018 season. Last May, four-year starter and 2017 Patriot League Goalkeeper of the Year Christian Carson-Banister graduated, leaving behind a question mark as to who would take over for the Terriers (6-7, 2-5 Patriot League). “Christian was a Third Team All-American so we were certainly concerned that we would potentially take a dip there,” BU head coach Ryan Polley said. Enter sophomore goalkeeper Joe McSorley. Not starting a single game during his freshman season, McSorley appeared in just four contests. The Forest Hill, Maryland native made his first appearance in the Terriers’ second game of 2017 — an 18-8 victory over the University of Massachusetts Lowell, where he played for just under 11 minutes and stopped eight shots he faced. McSorley said that backing up Carson-Bannister last season had a tremendous impact on his play and called him “a great mentor” who taught him about different aspects of the game. Prior to his time at BU, McSorley played lacrosse at the Calvert Hall College High School located in Baltimore. It was there that McSorley started for four seasons on the varsity team and served as the team’s captain during his final two years. He received Second Team All-Metro honors as a senior and was selected to the MSLCA Second Team All-State in 2016. While McSorley had success as a high school player, he said he does feel pressure in succeeding Carson-Bannister. This season, the sophomore has already been named Patriot League Goalkeeper of the Week three times. The goalkeeper’s most recent accolade came on April 9. This followed his best performance as a Terrier, in which he made a career-high 16 saves during BU’s 8-7 victory over the United States Military Academy. While McSorley’s previous career-high was 14 saves in the Terriers’ 19-18 overtime loss to Harvard University on March 20, he has made double-digit saves in all but two of the Terriers’ contests this season. Polley noted that the strong play of McSorley adds extra confidence to the rest of the team during matchups. In the early part of the season, McSorley’s numbers were hampered by the loss of sophomore defender and long-stick midfielder Chase Levesque and junior defender Quintin Germain, who were out with undisclosed injuries. McSorley also credits his defense as a factor for his success this season. The Terriers allow an average of 11.62 goals per game, placing them second-lowest in the conference, but for three weeks prior to this weekend, they limited their opposing team to eight or less goals per game. In this same stretch, McSorley posted an average goal save percentage of .634. This season, McSorley has started all 13 games for BU and his 11.62 saves per game tops the Patriot League while his .514 save percentage ranks third in the conference. Despite having a dominant season and being the team’s backup goalkeeper last season, Polley said that McSorley had to win the goalkeeper battle during the fall and the team’s scrimmages leading up to this season. 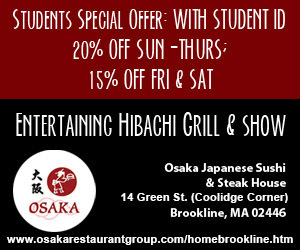 His performance will be crucial for the Terriers as they will look to clinch the program’s second-ever playoff berth with a win Friday night against their final regular season conference opponent, the College of the Holy Cross. Making the Patriot League tournament is a large goal that McSorley said the team has.